Bhang lassi, a south Asian treat, is a drinkable preparation of cannabis. The term ‘Bhang’ can refer to a number of different cannabis goodies ranging from hash-like concoctions, edible candy-like balls to beverages. According to Martin Booth’s ‘Cannabis – a History’, bhang refers to the lowest grade of cannabis sold in India, cannabis leaves with a few flowers mixed in. The other grades of marijuana are ‘ganga’ – female marijuana flowers, and ‘charas’ – hash. ‘Bhang’ grade marijuana has traditionally been used to prepare edible and medical cannabis formulations, though many bhang lassi producers today use ‘ganga’ grade marijuana in their preparations. We’ll focus on the beverage preparations popular in many parts of India, bhang thandai and bhang lassi. In Hindu culture, recorded use of cannabis goes back to 1000 BC. Despite years of prohibition, cannabis remains important in Indian culture, where it plays a role in the institution of ayruvedic medicine. The Indian government licenses bhang vendors and medical preparations of cannabis can be obtained in ayruvedic apothecaries. Consumption of Bhang is associated with the worship of lord Shiva and the celebration of Holi – the spring festival of color. Holi is particularly popular and celebrated with gusto (and lots of bhang) in northern India. One of the main traditions of holi is the use of colored powders on others; festive bonfires are also involved. Lord Shiva is said to have discovered the transcendental properties of bhang, earning him the epithet ‘Lord of Bhang’. The ancient Indian text the Arthaveda describes bhang as a beneficial herb that reduces anxiety. 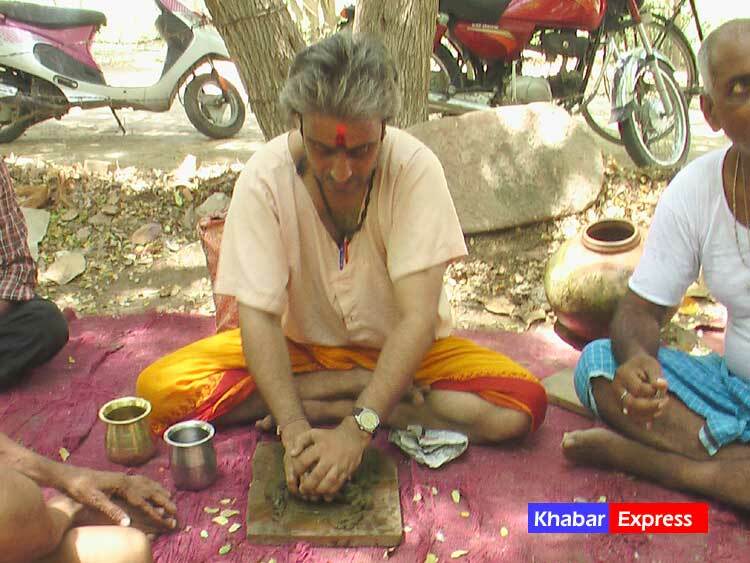 Bhang is used by some holy men to boost meditation and achieve transcendental states. The classic north Indian bhang beverage preparation, bhang thandai, is made with milk, nuts (usually almonds, sometimes cashews) and spices including lots of black pepper and cardamom. It is sold in marketplaces and by street vendors. 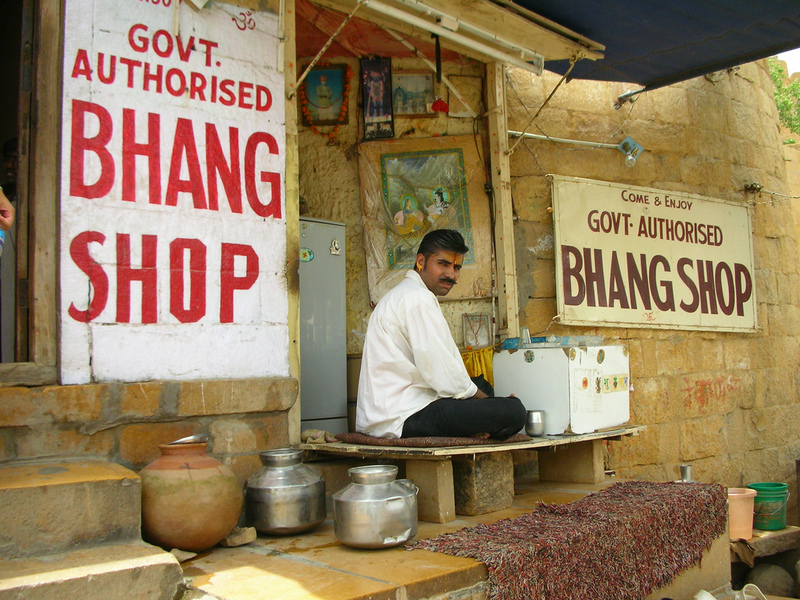 There are government sanctioned and licensed bhang shops. Some The city of Varanasi is famous for its bhang preparations, and street vendors prepare and sell it at the ghats (stair terrace areas leading down to the river). Bhang preparation - grinding the cannabis. From Khabar Express Website. Different preparation methods are used to create bhang beverages. Because the active ingredients in marijuana are fat soluble, it is necessary to have fat in some form as a key part of the recipe. Many recipes involve boiling the cannabis in a bit of water, straining out the plant matter and then grinding the plant material into a paste along with some of the fat containing material (whole milk or nuts). A mortar and pestle are used to grind cannabis buds and leaves into a thick paste. Milk, ghee (clarified butter) and ground nuts are added to the cannabis mixture. Spices are incorporated and the beverage is served chilled. Bhang lassi is a ‘special’ lassi made with bhang in lassi, a yogurt based beverage. Lassi comes in many flavors, and can either be a savory, lightly salted beverage or can be a sweetened concoction incorporating fruits. Mango lassi is a popular flavor available at Indian restaurants in the US and Europe. From Society for the Confluence of Festivals in India (SCFI). (recipe from the Society for the Confluence of Festivals in India (SCFI). Please send us your bhang recipe or stories about drinking cannabis for a chance to win a Stoner Living gift bag! This is something I'd love to try, everyone thinks that the new wave of bongs such as the percolator bong is the way to go, but I say don't forget the old methods too! There's no denying in the fact that cannabis seeds are packed with essential nutrients. These controversial, yet healthy, beans are one of the most sort-after genetically engineered products in the market.